This design shows wonderful free-hand work done with the cold chisel and stampwork executed with handmade stamps on the shank. The oval of Mediterranean red coral is set in a handmade, notched bezel. Impeccable detail. "H Jim" etched with a jeweler's scribe inside the shank as hallmark. 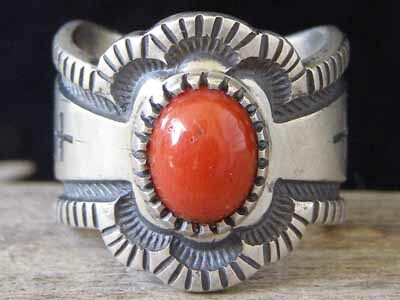 Red Coral: 3/8" x 5/16"
Width of shank in front at coral: 13/16"
Width of shank on sides: 5/8"